Here we go with the special event to end this year on a Celebrative note. Before we get into the details....I would like to thank all the readers for making 2013 a special year for me. I remember leaving my blog unattended for almost 2 years and when I got back...I still see my blog respiring with its viewers and adding readers allowing it to breathe. I took it to myself to blog and I have been blogging from then on. When I introduce myself...my blogging passion took a back seat to be mentioned. But in 2013, I did mention it and my passion was appreciated by my interviewers and got me a job in Deloitte. It certainly played a pivotal role when I was asked what differentiates me from others during my Interview. From then on I hit the road even harder...I got recognized...won several contests...did many reviews and got my love from around the world. How can I just say a mere thanks to all... So let me celebrate it with you and let you know that you mean a lot to me and so does my blog. What to do or Cook? It is very simple. 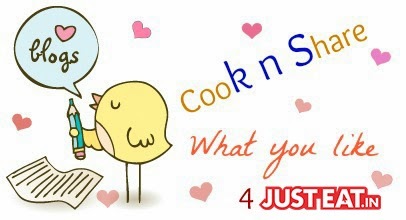 You can cook and share your favorite dish. Be it starter, soup, main course, desserts or even a simple milkshake. It can be anything. No time frames...no specific ingredient to use.. Just cook what you feel like and share it. This event is in association with JustEat.in who will be giving away Rs.500 gift voucher to the winner. Thank you so much JustEat.You also have another exciting gift apart from the voucher. 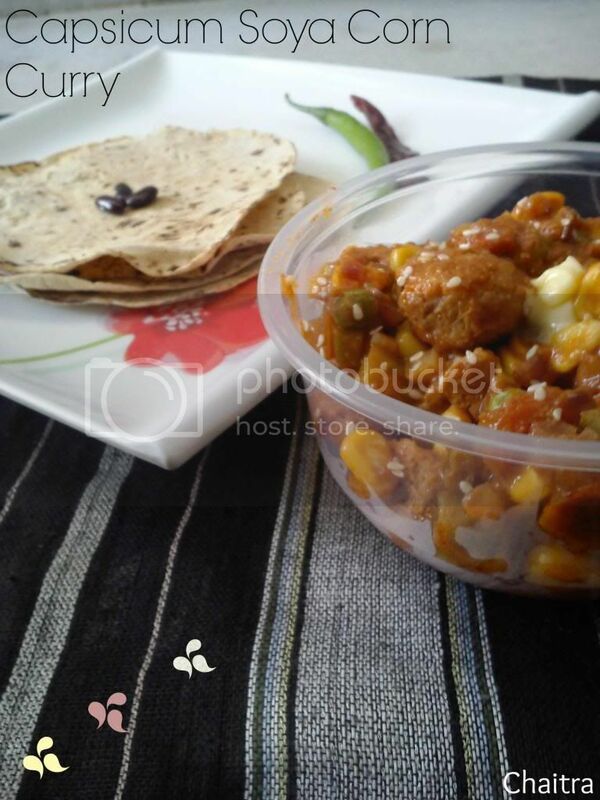 Another blogger would stand chance to win Sanjeev Kapoor's Gift hamper from my end. It will be a combination of recipe books and spices/ready to cook mix or pickle mixes. Here I will be giving total liberty to the winner to choose spices or book of his or her choice. Isn't that exciting and inviting you? Just scroll down and you will see the linky tool. Enter the details it asks and you are good to go... So no rocket science here. It is real easy. Just Eat.in voucher will be given to bloggers from Hyderabad,Bangalore, Gurgoan, Delhi, Noida, Ghaziabad, Faridabad, Mumbai, Pune and Chennai. Hamper from my end is open to all Indian bloggers. Even bloggers outside India can participate but they would need to help me with Indian address to send in their hamper. No limit on the number of entries you can send in. Archiving posts are accepted. Just like my blog on Facebook and follow it on Google plus. It would be really nice if you can mention the logo and about the event on your blog or on the post that you have sent. I will surely count that in for those who have done. After that just leave me a comment with the email ID or ID's which you have used to like and follow. You are good to go with it. Shoot me a mail to aathidhyam@gmail.com or use the contact form. Christmas......brings those innate memories deep inside. I love the festive mood that Christmas brings...the season of fun,joy and happiness. Brings in about strong urge for baked goodies and other delicacies. I still do not understand the reason why we end up making some savory or sweet dishes for most festivals and yet Christmas has its own way and stands apart with baked goodies and chocolates etc. My chocolate making craze is touching its peaks and I am loving the flavor that emanates each time I melt chocolate. My friends have been dragging me into chocolate making and my latest experiment was with rum n raisins which turned out to be super hit while I anticipated it not to be. I ended up using real rum soaked fruits and little rum instead of using rum essence. The recipe will be posted soon. So getting back to the recipe which reads on my post header. 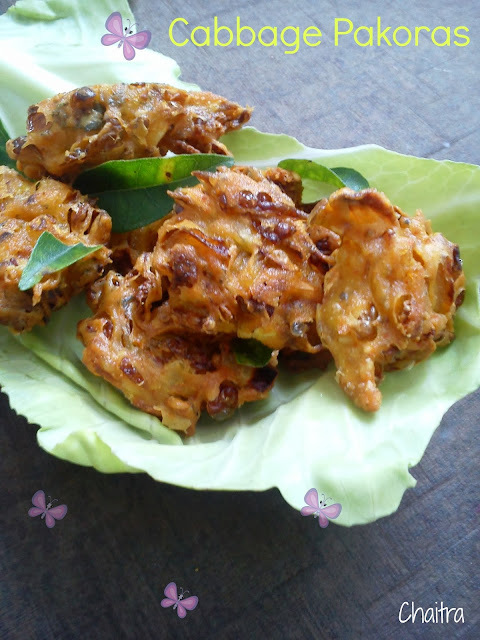 This is a simple no mess and easy to make recipe which was handed over to me by my friend. Its a sure shot win if you are a beginner just like me at baking. Secondly my blog has been deprived yummy baked goods for quite a long and now I pull myself to do something like this. Take a bowl and sieve the dry ingredients like Flour,baking soda,baking powder, cocoa powder(if using) and oats powder. Keep it aside. Preheat your oven to 175 C. In another bowl, cream butter and powdered sugar with the help of a whisk until softened and add vanilla essence and chocolate chips to it. Now add the sieved dry ingredients to this butter mixture. Combine all the ingredients well to make it soft pliable dough with the help of milk. Divide this mixture into equal parts. Shape these balls into cookies by flattening them on a baking tray lined with butter paper and place the cookies at a distance from each other. 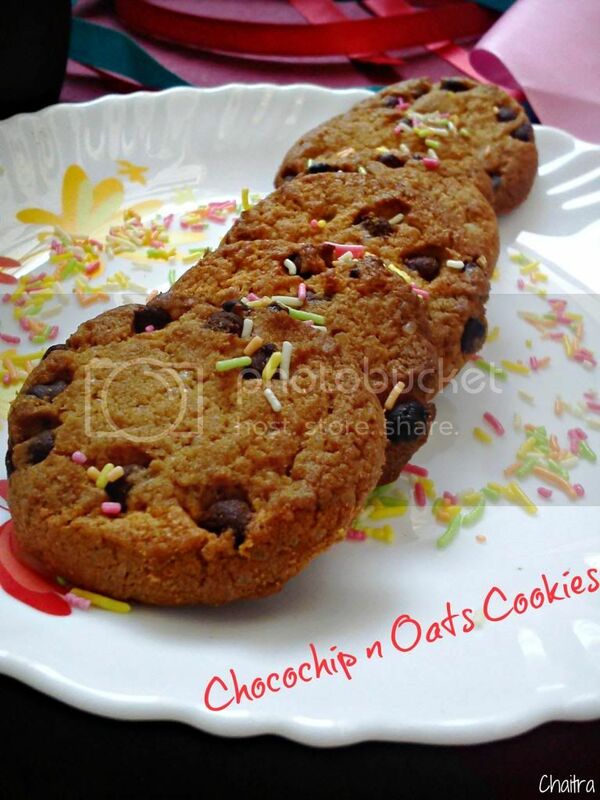 Bake these cookies for about 15 to 20 mins for chewy ones and 20-25 mins for crisp cookies. Once done, cool them and store in a air tight container. 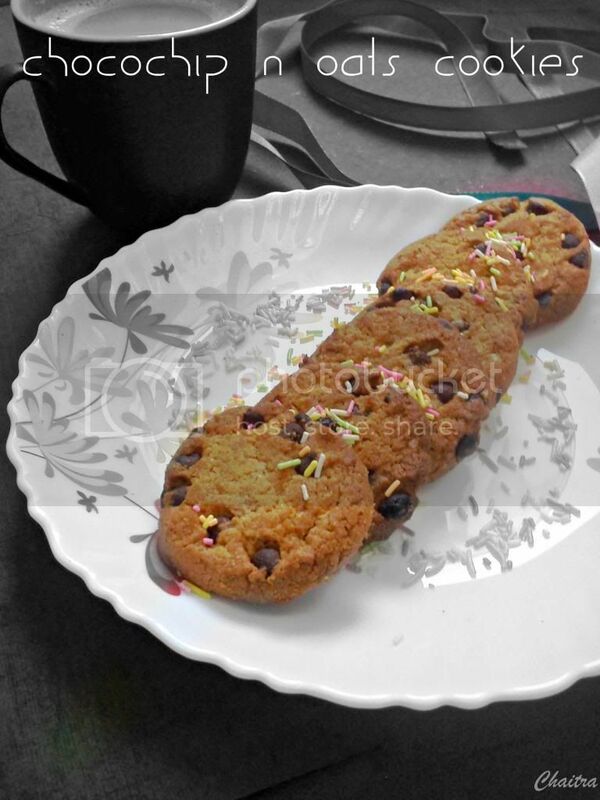 Here you go with Yummy, crispy and light cookies. Baking time depends on your oven type, so keep an eye once the cookies turn golden brown in color and this usually happens after 15 mins. I used whole wheat flour instead of all purpose flour. But you can use half a cup of all purpose and half a cup of whole wheat flour. 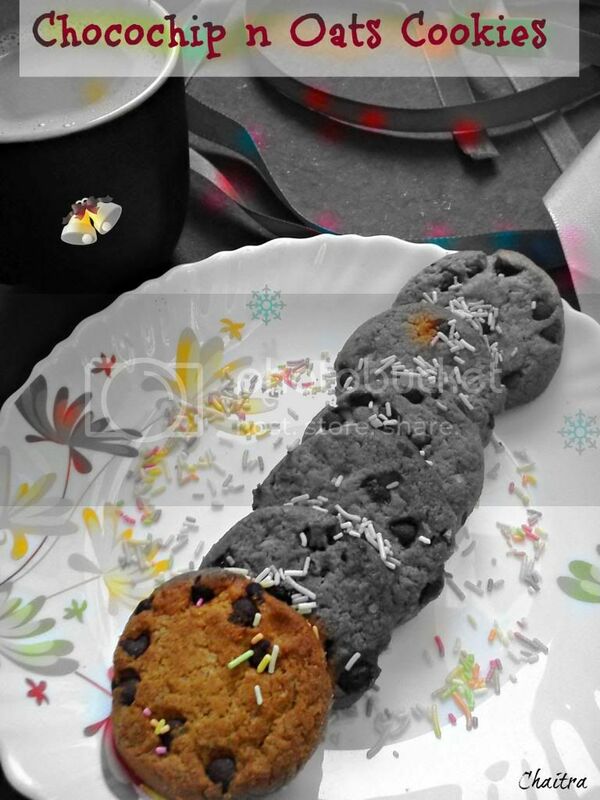 I do not like intense sweet cookies. So reduced the sugar amounts. But if you have a big sweet tooth. Please feel free. I was feeling like cooking what was on my mind yesterday... I was in full swing to pamper myself on a lazy sunday.... People around me were covering themselves with blankets and were indulging in something piping hot food like soups....snacks etc....and I wanted to eat a pudding and that to a chocolate one with nuts... I browsed many websites but couldn't find one which could be made in a jiffy with readily available ingredients. After huffing puffing for a while without any luck.... I remembered a recipe which I read in one of the blogs... I wish I could remember the author as well...I went reconstructing the bits and pieces of my vague remembrance..and then comes my pudding out of scratch~ Chocolate Mug Pudding. This heavenly pudding was sinful. Hey also look at my site layout and let me know how it is.... I struggled one whole day to make it look this way... Still the work is in progress... You will get to see more. 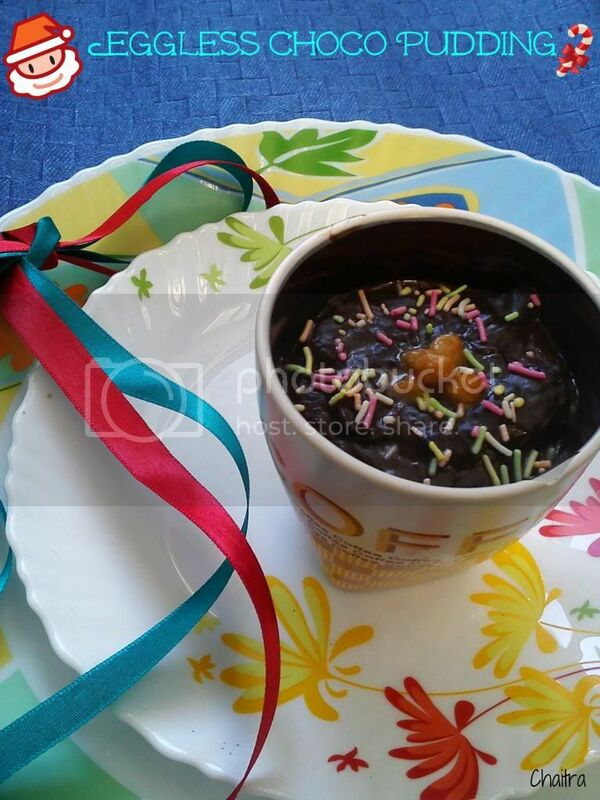 Come let's indulge in this no bake and easy to make Pudding. Butterscotch nuts and colorful sprinkles or chocolate shavings for decoration. 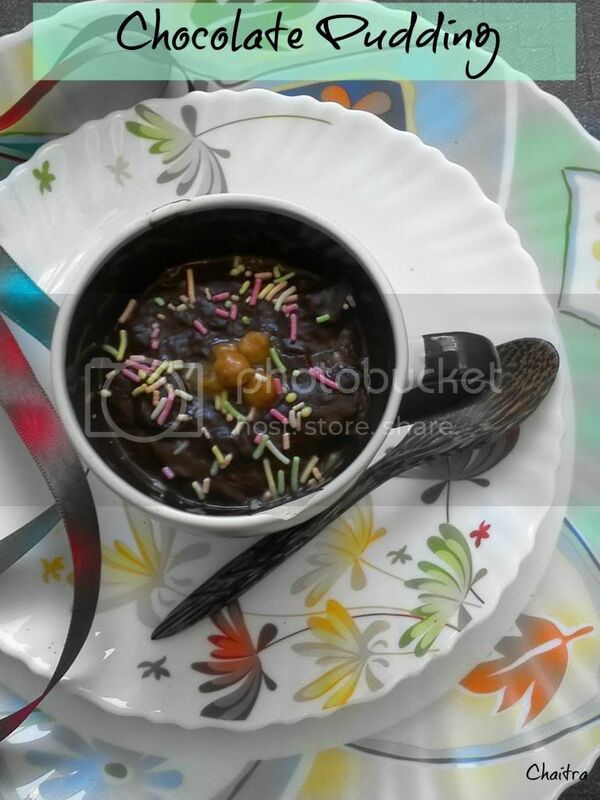 Take a bowl and add custard powder, cocoa powder and sugar.Mix all the ingredients well and then add 1 cup of milk. Whisk this mixture well to get semi solid consistency. 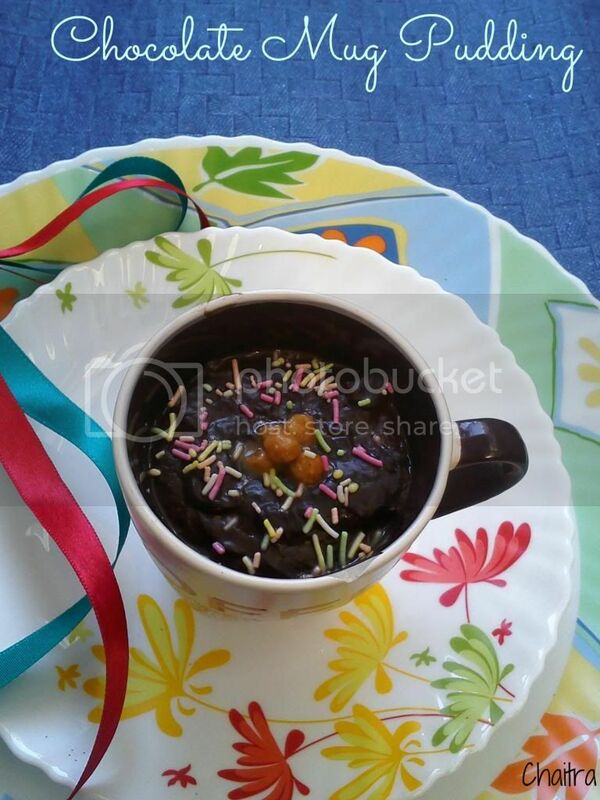 Take a heat proof bowl and add milk chocolate pieces and melt it using double boiler method. Take a mug and layer it with crumbled fruit bread. Top it with a layer of chopped nuts and keep it ready. You have got to be super quick to break the lumps as this mixture settles down and gives you a run. Once the mixture is thick(5-6) mins or less. Off the flame and transfer this sauce to your mug. Garnish with butterscotch nuts and colorful sprinkles. Refrigerate for an hour. 1) Alternatively you can use Corn Flour instead of custard powder. 3) You can use whipping cream and flavor it with chocolate and the creativity can go endless. I saw a basic one... adding bread was out of my head. 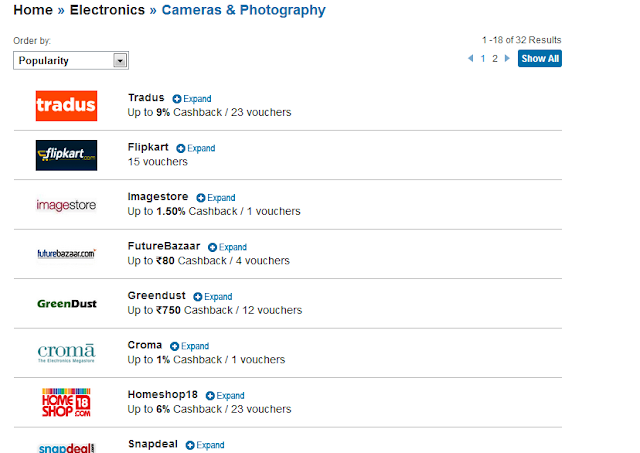 "Click me....I am hungry for discounts"
"Scratch and claim your discount"
This list goes on with coupons and tags... but when you are buyinga discounted item....you cannot avail the coupon you have claimed or any other money back deals... 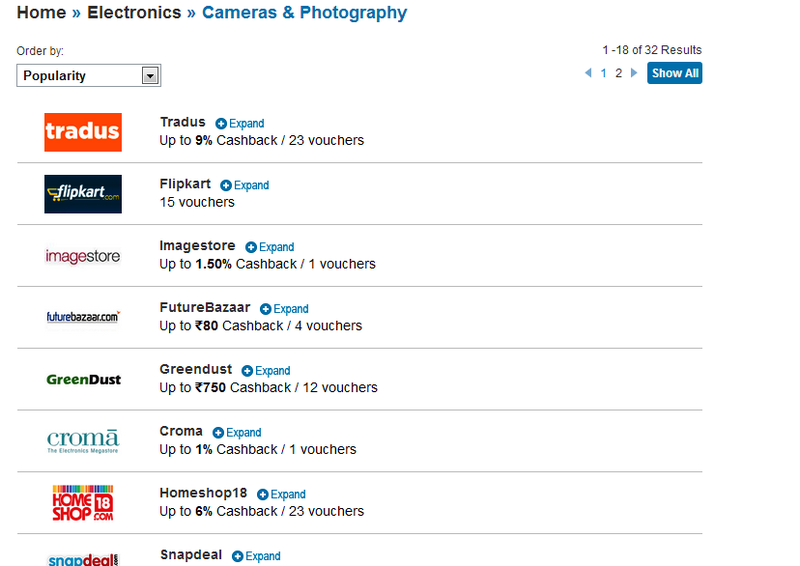 But I found something really interesting wherein you can get the discount as well as cash back. Yippie that sounds exciting and I am totally game for it... Is it what that I hear from you????? Yes.... I was asked to check out Cashkaro.com.... I jumped in right away to find out what the website is all about it? Its partners....how it works and the payment methods. 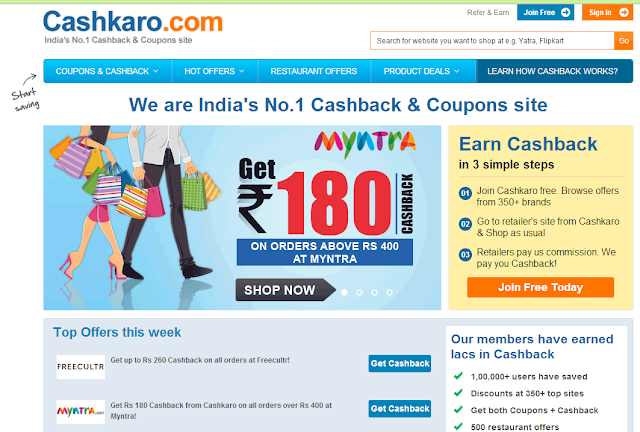 The moment you log in to Cashkaro... you will see that it is a well designed and easy to navigate page with so many exciting options whooing from shopping to travel....from restaurants to movies.... Cashkaro is partnered with more than 350 brands like like Snapdeal, Myntra, Dominos, Firstcry, Yatra, Paytm, Redbus, Foodpanda & more. This team is on a mission to provide its users exciting offers as well as happy cashbacks. Once you do so... you will have a coupon code which comes onto your screen or you will have a specialized link which takes you to their partner website and you know the rest to do. I have been eyeing for a camera for quite sometime now....I am just managing my blog pics with my Sony Xperia mobile(No complaints...they are of great quality because of its high end pixel camera)....when I chanced on Cashkaro which offers deals on cameras....you should guess what am I upto.... I am going to buy a camera......my mind is still hovering around Nikon L320 or Nikon L820 so that is the reason why I wrote...I am going to.. 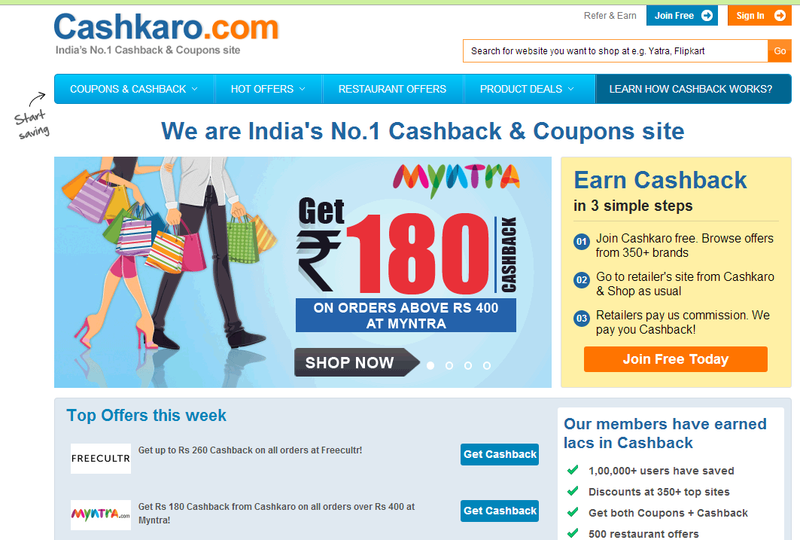 When you compare the deals provided by Cashkaro with their affiliates you will see that the prices are slashed and lower than most of the websites. Double Margherita @ Midnight with a Panda. What???? I don't see any relevance to the heading and it is all odd pair combo that I wrote out of my mind. Some experiences are good to remember and will remain with you especially when you are badly in need-----So is this one. Well you will get the sync by giving your brain a run. Late night cravings and irregular shift timings have been part of my life for the past 3 years and every now and then my body alarm takes sometime adjusting to the nocturnal requirements. Last week,my team mates sat robotically working seriously on their laptops and none of us din't bother to take a minute to breath out for food or tea. Cling...Cling.... Tik...Tik.... Laptop sounds....... Yippie we have a Panda...... My old buddy~The food Panda.. who snuggled me out last time without greasing my hands with lavish spread inviting me. Most of the restaurants are closed by 11:00 PM and as city starts to pull its night blanket in chilly weather...getting yourself almost nothing,I remembered Panda as we needed desperately to eat something. I started browsing Food Panda website. Let me tell you all that every time I visit this site... I have something new tantalizing my taste buds along with exciting discounts without aching my pocket and also leaves me as a happy camper smiling broadly. For me discounts woo me so much that they leave me an option to go pamper myself again. Its a simple strategy. With the same amount... You can enjoy two different meals ...two different times. I would surely vouch for this Panda and it is always at rescue and this time we had 5 more people joining the Food Panda club from my team who are totally in love. You will truly love it.. The chat feature helps you understand their concept and how it works apart from ordering food of your choice. Exciting Offers+Exquisite Menu+Lovely Team =Food Panda Team. Pricing options and discounts: Simply Awesome. I really love this. I would really appreciate if this service expands its boundaries. 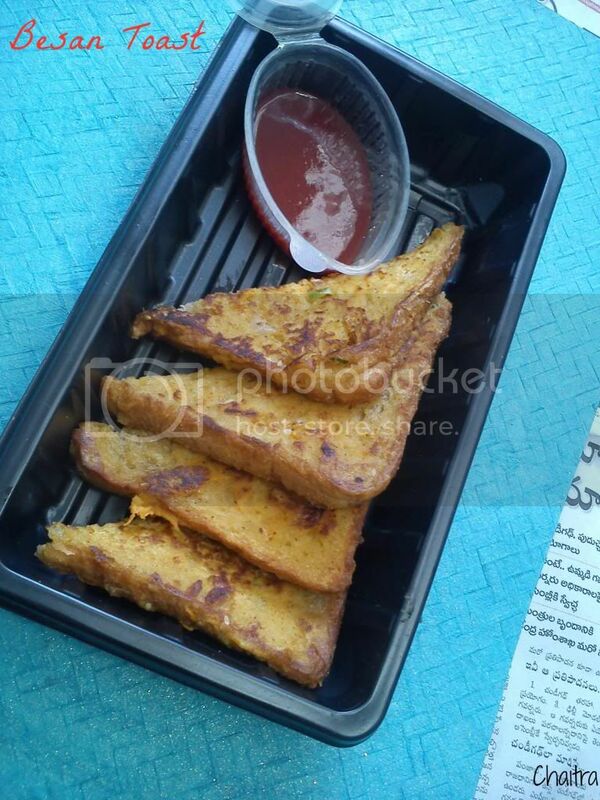 You can check out their website along with elaborate menu display tantalizing the taste buds at http://www.foodpanda.in/ and also download their mobile application by visiting http://www.foodpanda.in/contents/apps#. Cheers to team Food Panda. Simple and easy peasy recipes sometimes keep your hunger pangs at bay. I have mentioned many times on my blog that my job demands unscheduled shift timings and I skip most of the times my meals or grab a quick take away and satiate my hunger. On my quench to find out some simple and easy to make 15 minute recipes. I found this one and all you need is some ingredients and a bowl to mix up and then fry it. Lets go ahead and prepare this easy dish. Onion- 1 medium chopped finely. Take a bowl and mix all the ingredients except bread with little water. Make sure that your batter isn't too watery or too thick which makes the batter difficult to stick onto your bread slices. 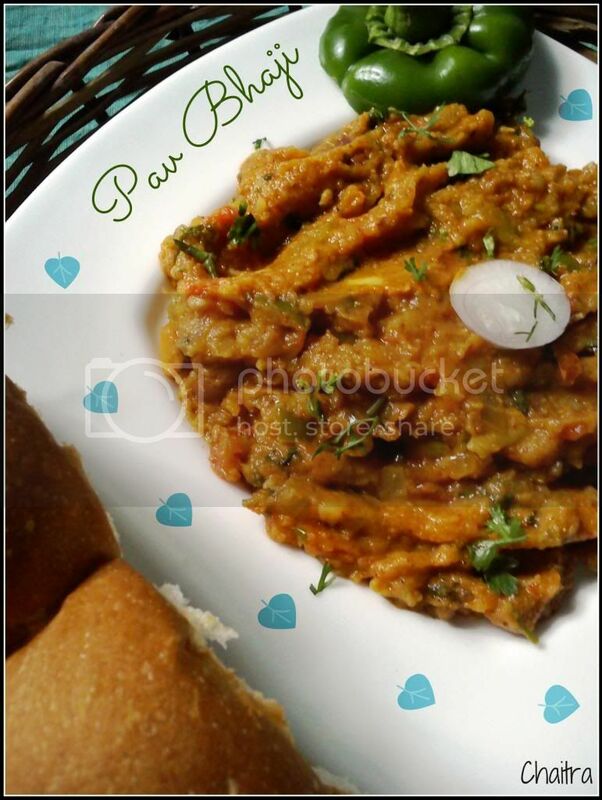 Take a bread slice and dip it in this besan mixture on both the sides. Make sure it is coated well on all the sides. 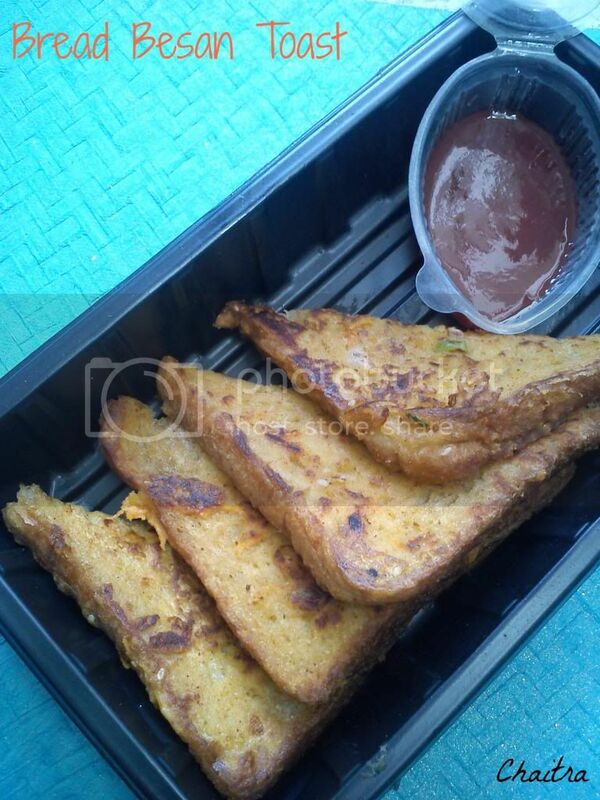 Drizzle oil and place this bread slice on a hot tawa. Roast it on both the sides and serve it with tomato sauce. Make sure you do not use too much of oil and that your tawa or griddle is hot. Serve hot. Once the bread slices turn cold, you will find it difficult to swallow. I blog very irregularly because of my shifts but the love it is getting and the recognition it is bringing to my door step is just adorable. Apart from all this stuff...I have attended a chocolate making class hosted by one of our food blogger's and I had so much fun making chocolates and my friends were totally taken by the taste..that they are asking me to get commercial...but my job and other things get me grounded...so may be in future I nay really consider. Do visit Arundati's blog if you want to join in any of her classes. Coming back from cloud 9, 10 or whatever mine claims to be. Finally I have achieved the art of making soft rotis. After initial attempts of making the papads and crisps... I could find a fool proof soft roti recipe on my own and this surely works without any reasons to fail. I will surely post it soon. Today's recipe is a bachelor one when you have some left over bread or rice or rotis....you can just go and throw in some ingredients to make this gravy based curry. You don't have to be a great cook to make this simple and delicately flavored curry. Its very healthy too. Sauteing the vegetables would do everything. I made this recipe using Hudson Canola oil which I have received a few days back and the goodness of Canola made it a lot more flavorful and the health factor of my dish was boosted. 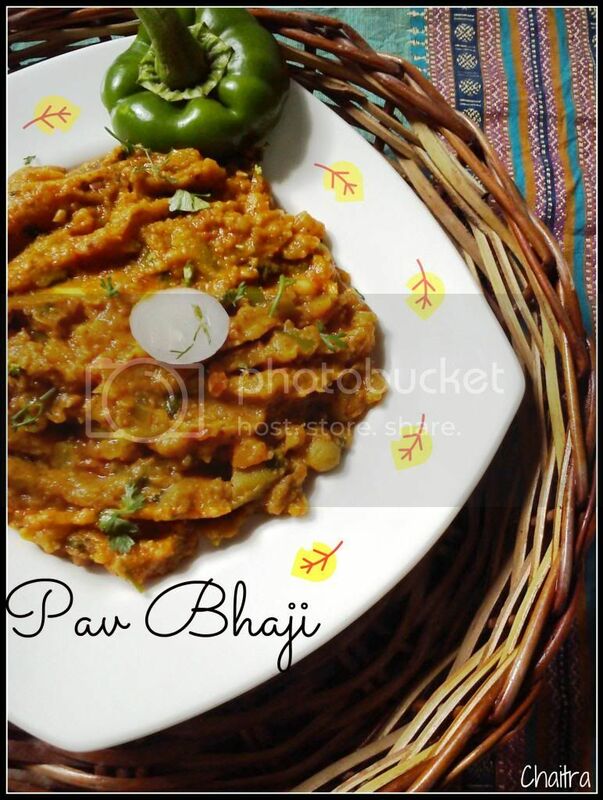 I would surely recommend it to my bloggers and also would switch on to this recipe considering its value adds. Let's go ahead and hit the road. Tomato- 1 medium sized chopped finely. Onion- 1 medium sized chopped finely. Heat oil in a frying pan and fry onions and green chilly for 2 mins with occassional stirring and then add ginger garlic paste . Fry until the pungent smell subsides. Now add chopped tomatoes and cook them to mush. Add maggi bhuna masala and mix all this masala well with the mushed tomato mixture. Add water and keep a lid on your pan. Meanwhile you can boil you Soya Chunks in water by adding little salt. Once they double in size, squeeze excess water and keep them aside. 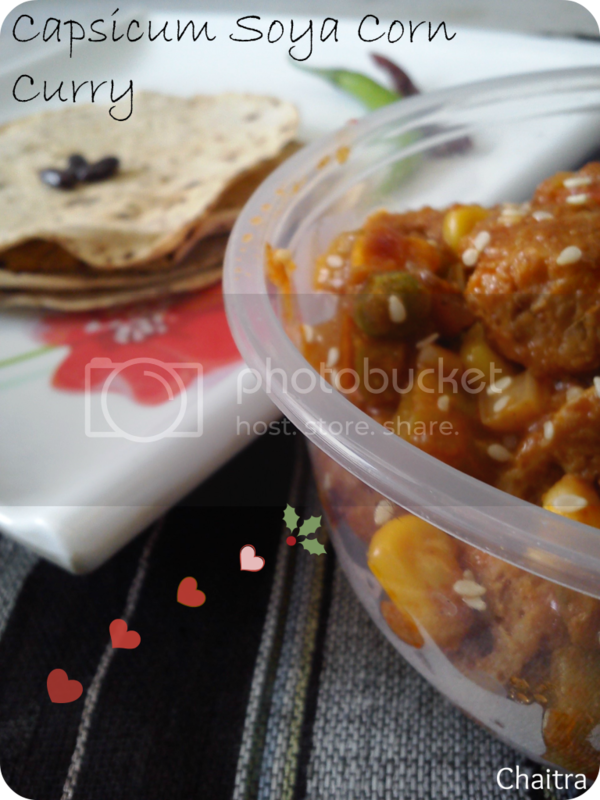 Once your sauce boils throw in capsicum pieces, green peas, corn and soya chunks along with the masalas. Combine and cook for 4-5 mins. Let the gravy thicken. Once you get the desired consistency, off the flame and transfer the contents onto a serving bowl. Serve hot with rotis, pulaos, rice or bread. 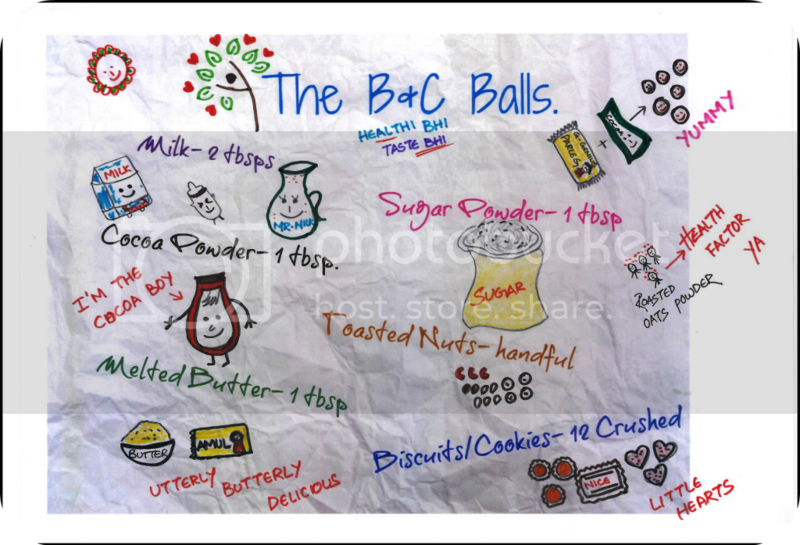 THE B & C BALLS ~ A DOODLE RECIPE. 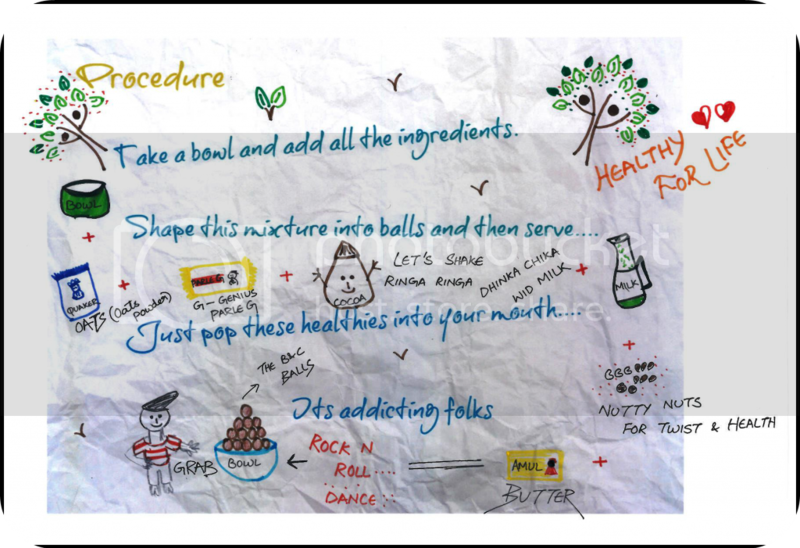 My first ever Doodle recipe. I never ever thought that I would go doodling something. Finally I did. When I saw blogadda contest, I wanted to give it a shot. Its a simple recipe and no mess recipe. Even a kiddo could do it all by himself. I will be updating the photos shortly. But for now my doodle does it all by itself. Please click on the picture to view an enlarged version. Due to space suffocation-had to use small size. Apologies for the same. It's real long that I took time in clicking a decent photo by setting background and working on props. This is one of my best pics that I would love to present to all. I worked a little bit after a long time adjusting things. 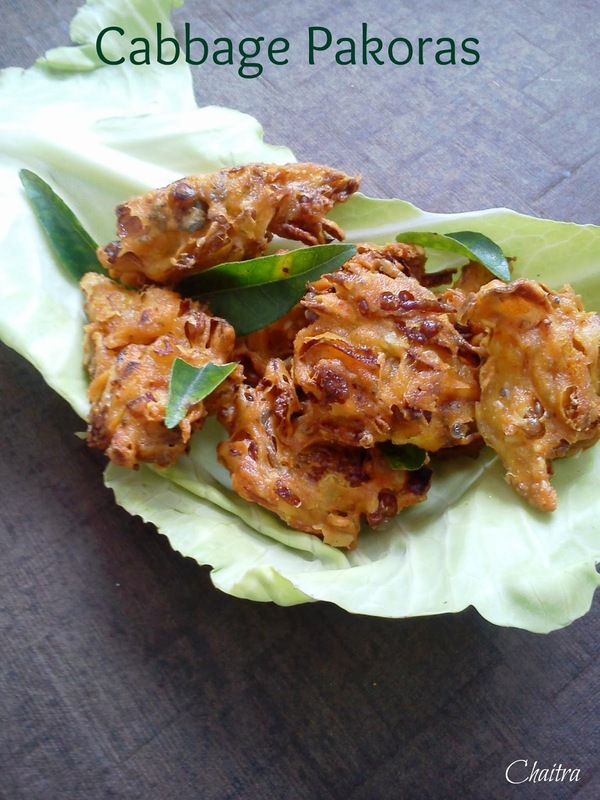 Presenting you a crispy snack which is perfect for tea time or as evening munchies. Cabbage- 1/2 cup chopped finely. Take a bowl and add all the ingredients listed above with 2 tbsps of hot oil. Now add little water and mix these ingredients. Consistency shouldn't be thin. It should be thick and be careful while adding water because cabbage will leave water. Taste the batter and adjust spices if required. Take a heavy bottomed pan and heat oil in it. Drop small portions of the batter into oil and fry until golden brown in color. Once golden brown, transfer them onto an absorbent paper and serve them with tomato sauce. Sometimes it is really very upsetting to see that someone from South Africa or Nigeria tries to hack your account. I don't understand their ideology behind doing such cheap things for a non profit blogger account. How many of you have had this experience? I was also a prey of this hacking attempt and it took 2 days to get my account retrieved and avail additional security options. So guys this is just a heads up to you all and to beware you all from this stupid act. 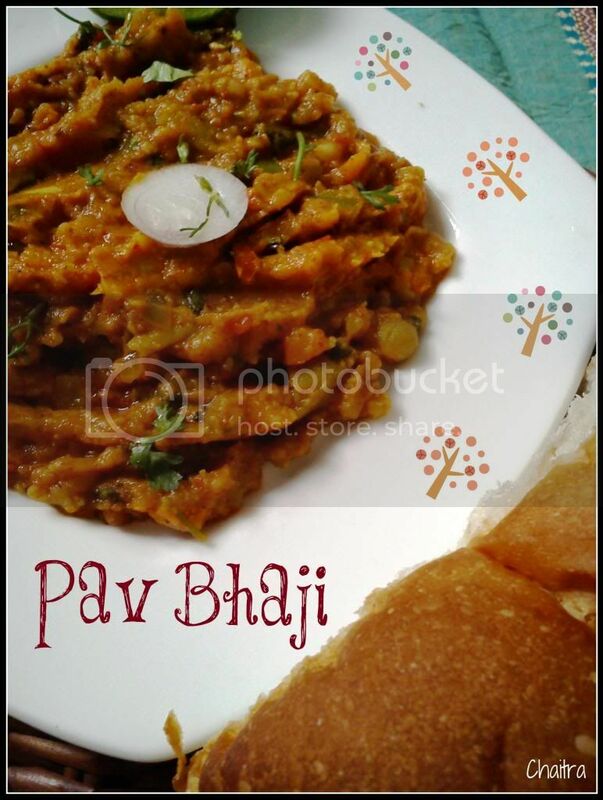 Pav Bhaji was on my to prepare list for a very long time..But I couldn't because of the shifts and Dal Chawal was more comforting to me after a night shift. Last Sunday, I prepared this and totally in love with this mildly spiced street food...You can toast your buns with butter but I don't want the calories sitting up on the waist line.. So butter was opted out. Coriander- 1 small bunch chopped. In a pressure cooker, add all the vegetables(except capsicum) and pressure cook till 4 whistles. Once the pressure is removed, strain excess water (if any) and reserve that vegetable stock for later use.Mash all the vegetables with a ladle and keep it aside. Heat oil and butter in a cooking pan. Add onions and saute for 1-2 mins. Now add ginger garlic paste and fry until the raw smell subsides. Add capsicum and saute for a min or two. Add the spice powders and mix all the ingredients well. Add mashed veg mixture to your cooking pan and keep stirring this mixture. Ensure that all the spices and the mashed mixture are well combined. Add vegetable stock and adjust salt. If you haven't added Pav Bhaji masala along with the spice powders. It's time for you to add it now. Incase if you want to adjust any spices, you can do it when the mixture is runny as it perfectly absorbs and blends. Add sugar and allow this mixture to cook for 3-4 mins. Once you get desired consistency, add coriander. Switch off and transfer the contents into a serving bowl. I pressure cooked tomatoes. Alternatively you can add them to sauted onion and ginger garlic mixture and cook them till mushy. Cauliflower is optional. But I love too many vegetables on my plate and protein packed food.. 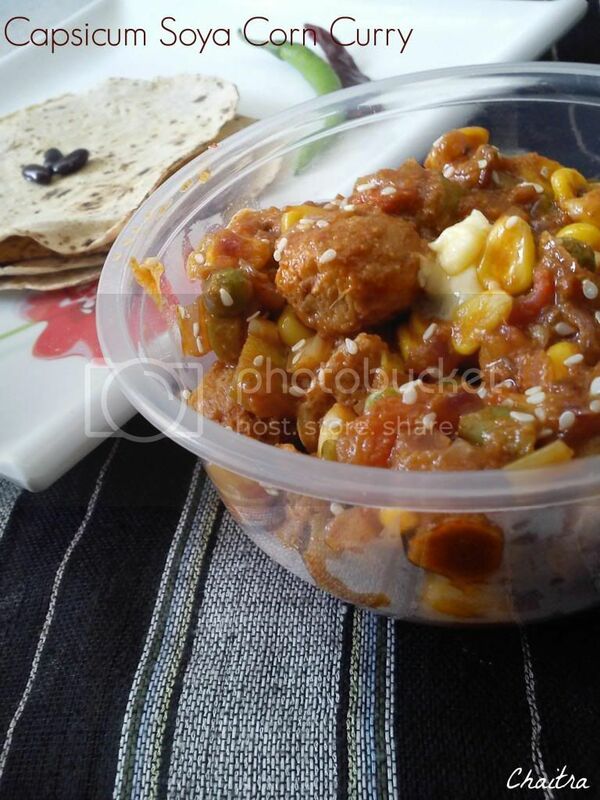 So I have added cauliflower and also Rajma (Rajma soaked overnight and boiled with vegetables). Toast the buns with butter and do not omit butter from the ingredients list.. Else you can settle like me with buttered bhaji and no toast buns.